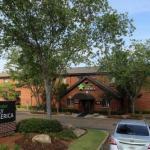 Full kitchens and affordable rates make Extended Stay America - Jackson - Ridgeland a good value for our guests. The three-story Extended Stay America has 71 rooms offering work desks and kitchens with refrigerators microwaves stovetops and eating and cooking utensils. Non-smoking rooms are available and Wi-Fi is offered for an additional fee. The hotel provides business services and an on-site guest laundromat. Parking is available and pets are permitted for an additional fee. Less than a half-mile from I-55 Extended Stay America is one mile from Northpark Mall and three miles from the shops and restaurants of the Renaissance at Colony Park. The historic Natchez Trace Parkway is two miles from the hotel and Ross Barnett Reservoir is 12 minutes away. Downtown Jackson the Mississippi State Capitol Jackson Convention Complex and Millsaps College are within 15 minutes and Jackson State University is a 20-minute drive. Jackson-Evers International Airport is 15 miles from the hotel.